The rout continues—and a cliffhanger at the end. 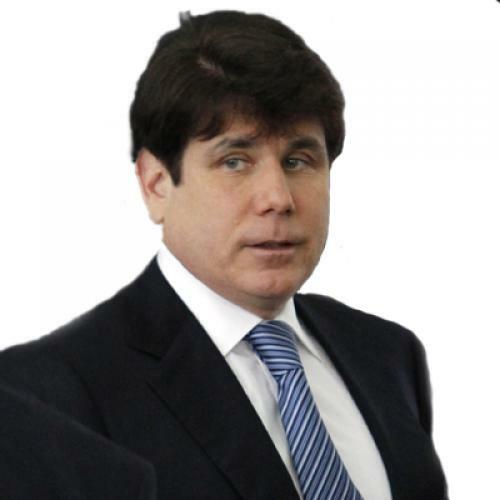 Click here to read Margo Howard’s first, second, third, and fourth dispatches from the Blagojevich trial. And click here for her assessment of the opening statements. After two months of testimony, closing arguments in the Blago trial finally began in a packed courtroom (carried by speaker to a larger, overflow room). The line for seats available to the public started forming at 4 a.m. It felt like a Twilight premier for adult dorks. Before Assistant U.S. Attorney Chris Niewoehner opened for the government, everyone from the Marshals to news people to observers were somewhere between aghast and appalled that the two young Blago daughters were in the courtroom. (A spin, perhaps, on “bring your daughter to work day?”) It was clearly a gesture meant for the jury … but given the general reaction, a miscalculation. As a Chicago TV newsman next to me explained during the run-up to the trial, whenever Blago was in public he would have “his people” behind him—so that the photographs would show he had support. My news friend added, “Often, if he could manage it, the supporters were in wheelchairs.” The two Blago daughters, Amy, 14, and Annie, 7, were perhaps standing in for “his people,” but they could not have been too interested in this kind of field trip. The younger one, with a sippy cup (she is, I repeat, 7) alternately napped on her mother’s shoulder, climbed around on her, and stuck out her tongue at spectators. My concern was that the older child was certainly able to hear the words “bribery,” “extortion,” “criminal enterprise,” etc. and know what they meant and to whom they referred. By happenstance, someone else near me said that the girls went to the same Montessori school his daughter did, and that all the teachers were told to tread very lightly when discussing the girls’ father’s situation because the family didn’t want the girls to have their father’s “troubles” in their lives. Niewoehner began by quoting Defendant #1. “This thing is effing-golden and I’m not giving it away for effing-nothing.” “This thing” being Obama’s Senate seat, and the F-word being the modifying adjective or adverb not just for this statement, but many, many others out of Blago’s mouth. “The governor of Illinois was scheming about how to benefit. It was about him.” Niewoehner then reminded the jury of the witnesses they had heard from: those that had turned state’s evidence and those who had been hit up for jobs, campaign contributions, baksheesh. He stressed that the various crimes listed in the indictment “do not require success. Just to attempt racketeering, wire fraud, and bribery counts. Just talking is a crime here. You heard him try to shake down Obama. He was basically saying: ‘Give me something in exchange for an appointment you want.’” Unlike the opening days of the trial where Blago was mugging, shaking his head no, and furiously writing on a legal pad, today he sat expressionless, swallowing frequently. Then he talked about Blago’s rising debt. “He was broke,” Niewoehner said, “because the FBI stopped him from selling Obama’s seat, word of the investigation was out, Rezko stopped paying Patti a monthly retainer, and he spent more than he made.” Then Niewoehner answered a question I was wondering about. What was the point, from Blago’s point of view, of rustling up all this campaign fund money (FOB/Friends of Blagojevich) if he couldn’t use it personally? Well, in addition to showing strength, it could be used to pay legal bills, of which there were several. They were now in the seven-figure range and rising. Meanwhile, the PowerPoint screen, quite large, displayed new headline titles, like, “ATTEMPTED SHAKEDOWN OF JOHNSTON.” That would be the racetrack guy who did not come through with a huge contribution and/or throw a fundraiser. Also appearing on the screen were certain sentences from the tapes, like, “Screw’em,” regarding someone who wouldn’t throw a fundraiser. Because there were two defendants (the brothers Blagojevich), Niewoehner was weaving in Robert more and more. Robert, he said, couldn’t admit he knew what he was doing, or what his brother was doing (mixing government with fundraising) because that was the crime he was denying. Now specific acts are beginning to be numbered on the screen tying them to particular counts: bribery, lying, etc. There are overlapping crimes, now divided into five groups … sort of the food groups of the federal crime world. They are: Wire Fraud, Extortion, Bribery (the heart of the charges), Racketeering, and False Statement. Next up was Mike Ettinger, on behalf of Robert Blagojevich. I am going to spare you a full recap of what he said; suffice it to say he was terrible. He didn’t make a defense so much as give the guy’s resume, “because a leopard doesn’t change his spots.” How could Robert be mixed up in this sleaze if he had a poor boy’s background, excelled in three different sports, tore part of his bicep (!! ), earned a scholarship, joined ROTC, had a father who was in the Serbian Army, was in the reserves for 16 years, helped the Red Cross, the YMCA, the poor people hurt by Katrina, the poor kids in Nashville, and you get the drift. I was rather hoping he was an advisor to Mother Teresa, but apparently not. He is overshooting his allotted time, so the ceiling lights dim. I think this might be the federal court equivalent of the orchestra playing off an Oscar winner who is droning on too long thanking his agent and God. Ettinger asked for a little more time, which Judge Zagel granted to him … perhaps to allow him a little more time to disgrace himself. Sam Adam Jr., responded, “I can’t follow your honor’s order.” Zagel replied, “You will follow or be in contempt of court. If it’s not evidence, you can’t use it. I will let you reformulate your argument because I think you based it on this premise.” (I am thinking: this guy will be up all night with his team crafting a new closing.) Zagel continued, “Get another lawyer if you feel incapable of following the ruling.” Adam came back with, “I would gladly go to jail because this man is fighting for his life!” The judge replies that it doesn’t do a client any good with a jury to have his lawyer either be told to sit down or get carted off to jail for being in contempt. At this point, Adam Jr. grabs his briefcase and leaves, while the other lawyers are still talking with the judge. So … the cliffhanger is this: Will another lawyer deliver the closing? Will Adam Jr. do it, as planned, and behave? Will Adam Jr. close and misbehave? This is getting to be a television show after all. Margo Howard is a syndicated advice columnist for Creators Syndicate and www.wowowow.com. Last year, she covered the Clark Rockefeller trial for The New Republic. Politics, Chicago, The Chicago Tribune, Amy, Mike Ettinger, Annie, Robert Blagojevich, Chris Niewoehner, Margo Howard, Senate, Illinois, Federal Bureau of Investigation, Sam Adam Jr.